Chrome OS has evolved, starting on laptops it has gotten on tablets too. 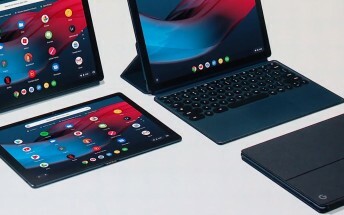 After Acer’s tab Google unveiled its own hardware – meet the Google Pixel Slate. The Slate has a 6MP screen with a sharp 293ppi pixel density. Google optimized the Chrome OS interface for a more desktop experience. It starts with a version of desktop Chrome, continues with the G Suite and, finally, split screen for better multitasking. The launcher uses Google smarts to predict which of these apps you’ll want to launch and it brings their shortcuts front and center. Google Assistant is deeply integrated as well. The screen has a 3:2 aspect ratio and supports stylus input. If you’re getting hints of Microsoft Surface, hold on – wait until you see the keyboard cover. It connects to the tablet via pogo pins, leaving the USB-C port on the side of the tablet free for accessories. There’s no pairing or charging necessary. The round keys are based on the lauded Chromebook Pixel keyboard. They are quiet as you type on them and soft to the touch. Better yet, the cover has been designed in a way that lets you tilt the screen at any angle you want, not just a few pre-defined angles. If you prefer a stylus, you can use the Pixelbook Pen. Adobe built a version of Acrobat that lets you edit PDFs and sign documents with the Pen. The Google Pixel Slate is great for multimedia too, not just work. Besides the sharp screen, there are front-facing stereo speakers. It’s geared towards cord-cutters with a 3-month free trial of YouTube TV. The service lets you watch live TV from 60 networks (sports, news, anything). There are two cameras on the Slate, both with 8MP resolution. The front-facing one is placed on the center, making it suitable for video calling. The wide-angle lens and image sensor with large pixels will let you chat in any room and with as many people you want. It features Portrait mode as well. The rear one also enjoys the software magic of the Google Camera, if you’re the type to use a tablet’s camera. Google takes security seriously, so it added a Titan security chip to the Slate. There’s built-in virus protection too. And since up-to-date software is vital, the Chrome OS will automatically update itself in the background. The Google Pixel Slate is coming to the US, Canada and the UK later this year. It will be available through Google itself as well as major retailers. The Slate itself will cost $600, but you’ll need to shell out extra for the accessories - $200 for the keyboard and $100 for the Pen.